Ellis Wray worked on a farm when he was ten - yet 30 years later, he had opened a retail shop in Luton. He became a successful entrepreneur who also led a double life for ten years. 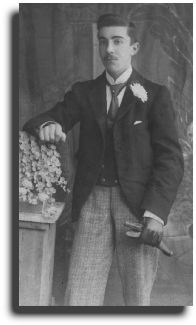 In 1852, Ellis’ father, Henry Wray, was born near Luton, Beds. in the village of Austage End, Kings Walden, Hertfordshire. He was the eldest son of Charles and Elizabeth Wray and was baptized at the local parish church on 5 December 1852. Unlike his older sister, Margaret, Henry was poorly educated, being unable to sign the marriage register. Perhaps he was sent to school late and set to work early as were his younger brothers, Alfred and Arthur, who were educationally ‘backward’. Henry’s father taught him the craft of hurdle-making. On Christmas Day, 1874 at Kings Walden church, Henry (22) married a local girl Mary Ann Mardell. She was five years older than her husband and was the daughter of a farm labourer. The couple settled at Heath, Breachwood Green, Kings Walden and had five children. In the 1890s, Henry and his family joined the drift from the countryside to the emerging town of Luton. In 1901, they were living at 66 Lea Road - a dilapidated district. Henry was employed as an iron foundry labourer and his daughters, Ruth and Lydia, found work as straw hat finishers. Then, towards the end of 1901, Mary Ann died. She was fifty-one. Later, Henry lived with his son Ellis at 12 Tavistock Crescent, Luton. He died there, aged 79, on 14 February 1932. The cause of death was ‘epithelioma’ (a cancerous tumour) of the tongue. Sadly, Henry probably choked to death. 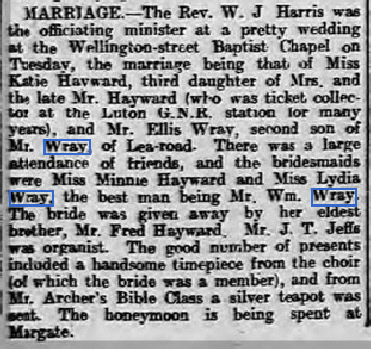 On 19 July 1904, Ellis married Katie Howard at the Ceylon Baptist Church, Luton. (Link to news report: Wedding) Five years later, on 4 February 1909, their only child, Winifred Kate, was prematurely born. She lived less than an hour. Ellis was later to say that his ambition was to have sons to carry on his business, but unfortunately Katie was unable to have more children. 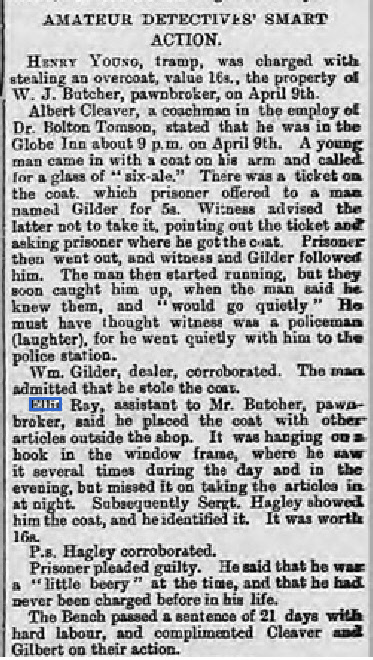 Ellis moved to ‘Butchers’ pawnbrokers at Bute Street, Luton - but an exchange of opinion with the owner escalated into an exchange of blows which left Mr Butcher without his dignity and Ellis without a job. In 1913, showing drive, determination and a developing business acumen, Ellis started his own business - initially a men’s clothing store – renting premises at 4 Castle Street Luton The shop was next to the Red Lion Hotel. Ellis and Katie, like many trades-people, lived above the property. Ellis’ commercial strategy was a reflection of his poor, rural background. Luton was the shopping magnet for the many farm labourers who lived in the surrounding villages and Ellis offered working-class clothing at low prices – ‘E. Wray for value’. From the outset he faced and overcame opposition from Luton’s other retailers. The shop’s windows were crammed with merchandise and every available position was used to show stock. The shop front was adorned with goods, and merchandise overflowed onto the pavement. At the start and end of the business day, it took almost an hour to set-up and to dismantle the display. Goods were illuminated by extra lighting to be certain that passers-by did not miss a bargain. The store was open until 7.00 pm on weekdays; 9.00 pm on Saturdays and before Christmas, it closed its doors at midnight. The business expanded. Nos. 6 and then 8 Castle Street were added to the store and with the extra space came extra lines – now Ellis sold jewellery, works of art, beds and bedding, carpets and rugs, sewing machines, cameras, musical instruments and umbrellas. Among their wares were also second-hand goods. However, the shop continued to sell its trademark clothing: a ready-to-wear suit cost just 14/11 (75p) and warm underwear and cord breeches were consistently in demand. It was Ellis’ boast that nothing had been made that he had not at one time sold. 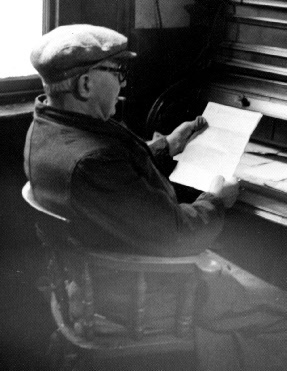 As a small shopkeeper, Ellis was exempted from military service during The Great War. However, possibly as a response to some adverse comments, he joined the Special Constabulary (left). As an upholder of law and order, Ellis did not sympathize with the post-war rioters of Luton. Ellis began to employ more staff. 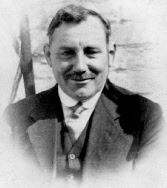 His right-hand man was Percy Windmill who worked for him for him for 52 years. Ellis’ older brother, William Wray (right), worked at the shop on Saturdays. The success of his venture encouraged Ellis to open another shop at St Albans Road, Watford in the early 1920s. This enterprise also provided him with the opportunity to live a double life away from Luton. Ellis formed a relationship with Nora Isabel Moul who was 23 years his junior. Nora was born in 1901 at Gateshead, Co. Durham. She was the daughter of a ‘fireman stationary engine’ (or machine). Nora had moved from the north-east to London and thence to Hertfordshire where she nursed at Napsbury Mental Hospital. 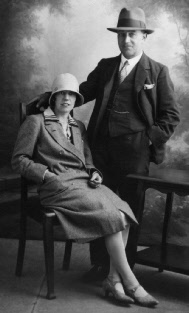 It is thought that she and Ellis met during one of his motoring excursions. Two sons, Edward and Gordon were born to the couple at Watford in 1925 and 1933. The early 1930s were unsettling times in Ellis’ personal life. Firstly, his father, who was living with him, died on 14 February 1932. His second son was born a year later on 29 April 1933. Then, his wife, Katie, passed away on 11 July 1935. The following year, in 1936, Ellis married Nora at Watford. The family moved into a new house at Ludlow Avenue which was situated in a desirable part of Luton. Their new home was evidence that the business was flourishing. As a result, Ellis was able to send his new wife and children to the seaside for holidays twice a year even in wartime. He was also able to indulge himself in his main leisure interest – ‘smart cars’. 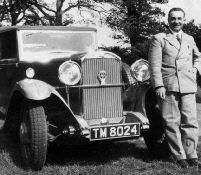 He bought a selection including Singer (2), Humber (2) and a Sunbeam Talbot. His favourite model was an Alvis; maroon with cream wings. But this was replaced following an accident on the A1 which left the car overturned in a ditch and Nora needing treatment for broken ribs and a punctured lung. Ellis continued working despite developing diabetes and suffering a heart attack in the 1950s. Nora persuaded him to retire to the Bournemouth suburb of Southbourne where he died following a final stroke on 6 December 1960. Because of his expressed wish, he was buried in Katie’s grave at Luton. Norah, who was considerably younger than Ellis, died at Exeter on 8 October 1987. After Ellis’ death, the business in Luton continued as a limited concern with Nora as the Chairman and Percy Windmill as the Managing Director. In the 1960s, Percy’s son, Peter ran the business. The rented premises were later sold to the Trust House Forte group who then extended the adjacent Red Lion Hotel. 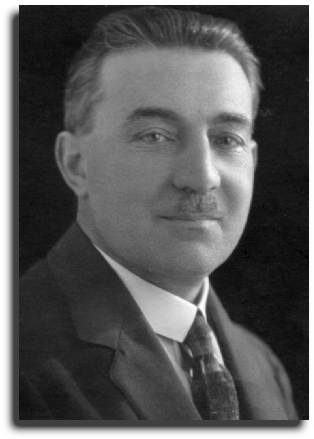 Ellis is remembered as a generous man – one who helped his siblings start a businesses, acquire homes and who supported them when their children were being educated. He also employed his brother in the shop. The incident involving his earlier employer was uncharacteristic, as Ellis was a peaceable man. He received regular visits from long-time friends who treated him with respect. Although his life-style was at odds with religious teachings, Ellis reflected his non-conformist background by sending his sons to the local Ceylon Baptist Sunday school. He enjoyed reading – his favourite author being Thomas Hardy. Despite his hopes, his sons did not follow Ellis into his business yet he was proud of their achievements – his elder son was awarded a BSc in aeronautical engineering at London University and was appointed as Chief Engineer of the East African Airlines. Ellis’ younger son is medically qualified and practised as a Consultant Anaesthetist. It’s Castle Street, Luton, in September 1949 and Alec Guinness was in town to shoot his latest film, Last Holiday. He played George Bird, an unmarried and unassuming salesman who visits a physician for a routine check-up and is told he has a newly identified disease which allows him only a few weeks to live. Bird, pictured above with Mrs Poole, played by Kay Walsh, accepts the doctor’s advice to take his savings and enjoy himself in the little time left to him. He decides to spend his last days in an up-market hotel among its elite clientele. 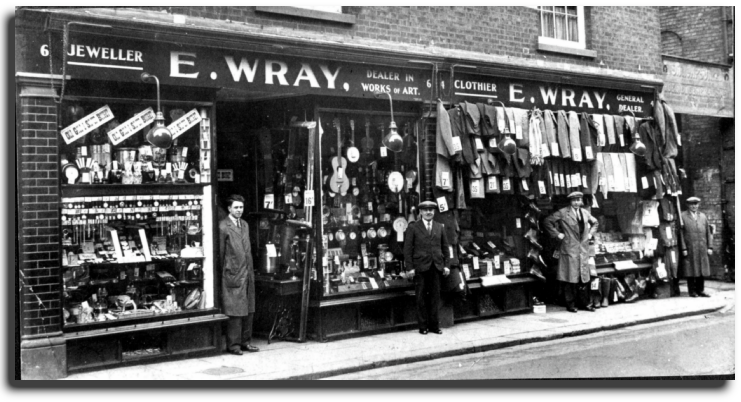 Guinness, who was to be knighted 10 years later, is pictured, second left, outside E. Wray’s store, which traded in Luton for 77 years between 1913 and 1990. 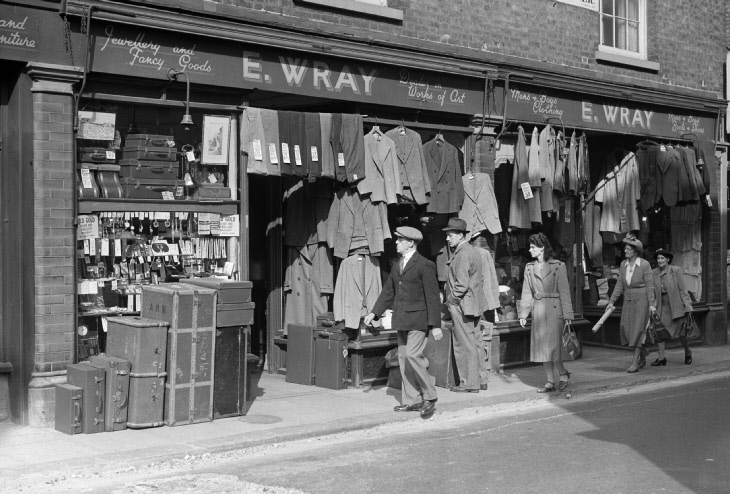 Wray’s, known as the working man’s clothier, carried stock that was large and varied. It took almost an hour at opening and closing to display or remove all the items that hung outside or stood on the pavement. Ready-to-wear suits were from 14s 11d (75p) or used ones from 8s 6d (43p). I do remember the episode of the filming in which the shop was used although I was not present at any time. I also believe that this lasted for several days and interfered with business but my father expressed the hope that it would prove to be a good advertisement. ‘Thanks for forwarding the picture; it certainly brought back memories of that day all those years ago (I was just 17). I remember the film crew invading the shop, turning it upside down, and creating havoc (even more than was normal!). Some passers-by were hired as “extras” for a few hours, earning themselves 21/- each (at that time a considerable sum) and your Dad was promised that a cheque would be sent to him later. That money never did materialise, causing considerable upset! Who would believe that such a picture could turn up after all this time – the film ‘The Last Holiday’ long ago passed into history. Perhaps I might look on the net and see if a dvd is available – it would be quite nice to have.